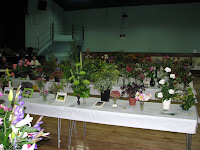 The Garden Club Autumn Flower Show on Saturday at The New Hall beat the recent bad weather. 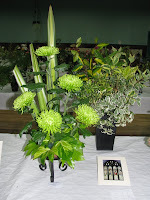 A record number of entries from 48 exhibitors meant the hall was bursting with flowers and foliage. A wealth of visitors and members enjoyed the colourful array of entries in all sections, despite the storms of the last week. 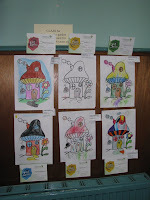 The judges commented on the high standard of the exhibits. In the Decorative Section the principal prizewinners were Jean Webb, Maggie Roberts, Ros Nichols, Tim Nichols and Maureen Coldham. 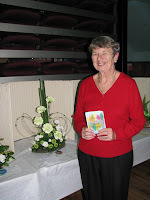 Jean Webb won the Award of Merit for her ‘Emerald Celebrations’ exhibit depicting 55 years of the garden club. 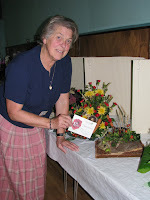 Maureen Coldham won the special award for the novice class ‘Harvest Home’. 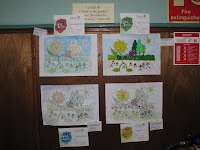 The winners in the Childrens’ Sections were Hugo Crawford and Toby Crawford. 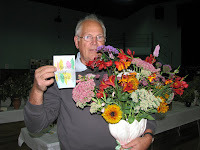 In the Cut Flowers Section the principal prizewinners were Sue Gollop, Alby Berry, Ann Crawford, Jean Bennett, Mary Smith, Peter Billing and Diane Hollis, with Peter Billing winning the Award of Merit for a vase of mixed hardy perennials. In the Shrubs and Trees Section the principal prizewinners were Monica Seatherton, Peter Billing, Angela Moore and Mary Smith with Monica Seatherton winning the Award of Merit for a vase of mixed flowering shrubs. 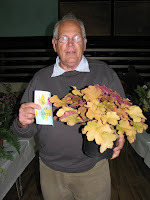 In the Pot Plant Section the principal prize-winners were Norah Mears, Peter Billing, Margaret Grose, Ann Crawford, Sue Gollop, Mary Coles, Jean Bennett, Jean Webb and Angela Moore with Peter Billing winning the Award of Merit for an unusual coloured heuchera. 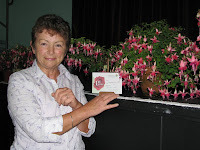 The Members Competition for a Fuchsia called Paula Jane, provided by the Club, was won by first time exhibitor Rachael Hart who won the Sue Gollop Trophy. 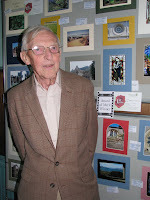 In the Photography Section the principal prizewinners were Angela Moore, John Mears and Norah Mears with John Mears, winning the Award of Merit with her photo of ‘A Window’. 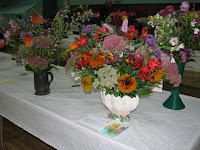 Finally, the Jubilee Class was won by Jean Webb with 27 points for a collection including a flower arrangement, a vase of mixed variegated shrubs and a photograph. Joint second was Peter Billing and Diane Hollis both with 24 points. 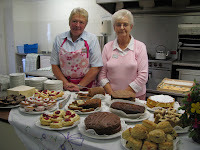 The Committee would like to thank the judges, Eddie & Pat Sherwood from Crediton for their time and hard work and all the helpers and exhibitors – new and old - for a top quality show.